With the popularity of H.265/HEVC/x265, more and more H.265 encoder and decoder have mushroomed. Simple x264/x265 Launcher is one of the popular tools. It is a Video Converter & lightweight GUI front-end for the x264 H.264/AVC as well as the x265 H.265/HEVC encoder, based on the Qt toolkit. If you need to encode video to x265 on Windows 8 and lower version, you can get it with simple x264/x265 launcher. But when you are running Windows 8.1 and Windows 10 or your OS system is Mac OS, simple x264/x265 launcher won't help you. Moreover, Simple x264/x265 Launcher is a video only encoder that you can rip Blu-ray and DVD to H.265 with it. With the right alternative to simple x264/x265 launcher, you can remove the trouble. Pavtube Video Converter Ultimate and its equivalent Pavtube iMedia Converter for Mac can replace Simple x264/x265 Launcher on Windows 10 and macOS High Sierra separately to decode H.265 to H.264 and encode H.264 to H.265. They are fully self-contained and no additional codecs or plugin's are required. With them, you can convert AVC, AVI, AVS, DivX, H.264, MKV, MOV, MP4, TS, WMV, Xvid, 3GP, TOD, MOD, MPEG, MPG, MXF, M2TS, ISO, VOB, AVCHD, etc to H.265/HEVC MKV and H.265/HEVC MP4. On the other hand, they can convert your H.265 video to H.264, DivX, XviD, VP9, MPEG 2, MPEG 4 video files. What's more, they also act as Blu-ray Ripper + DVD Ripper so that you can rip Blu-ray to H.265 and convert DVD to HEVC files on Windows 10 and MacOS High Sierra. Especially, the window version Pavtube Video Converter Ultimate has recently updated to v4.9.1.0 supporting the most advanced hardware acceleration NVIDIA CUDA & AMD APP by H.264/H.265 codec, which can give users 30x video transcoding speed than before. How to Convert Video to H.264/H.265 with Simple x264/x265 Launcher Alternative? The steps of x265 decoding/encoding is similar on Mac and Windows. Below snapshot are from Windows version. You can click "Add Video" button to load local x264/x265 files to the program. 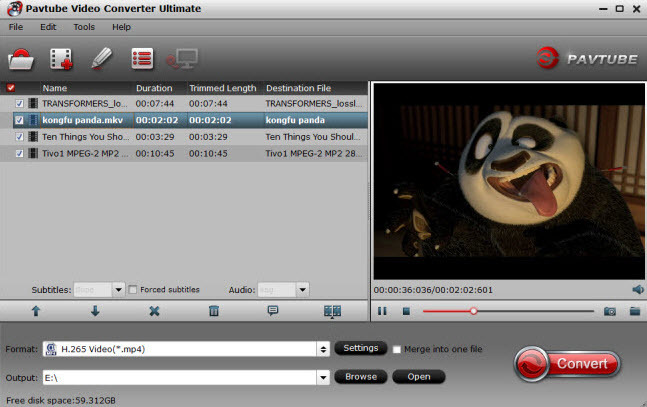 You can also directly drag the video files into the program directly. Batch conversion feature allows you to load multiple files at a time. Step 2. Choose H.265/h.264 Output Format. In order to convert any files to H.265, you just have to select the format you want your file to be converted to. 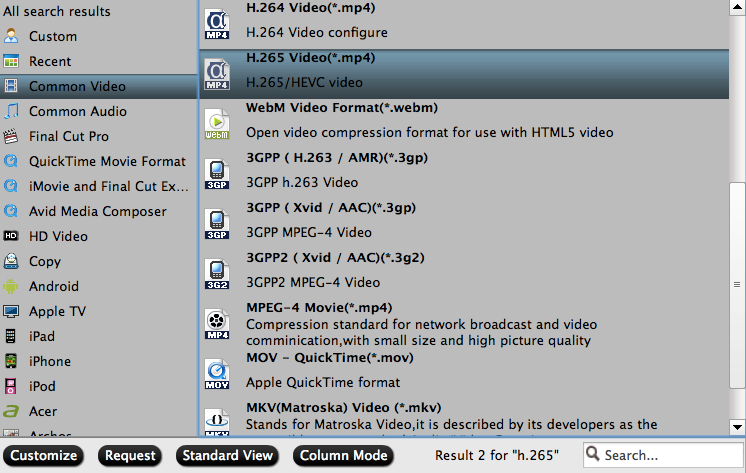 From the"Format" drop-down option, you can select one of the preset "H.265(*MP4)"video as the otuput profile format. If you want to convert H.265 to H.264, just choose H.264 Video. Now hit on the "Convert" button on software main interface to start the conversion. The speed of completion always depends on how big or how many your files are. In addition, with built-in video editor in the Simple x264/x265 Launcher alternatives on Windows and Mac, you can edit H.265 like merge H.265 files into one, crop H.265, trim H.265, rotate H.265 video, add subtitles/watermark to HEVC, adjust the H.265 parameter like bitrates, frame rate, aspect ratio, audio volume and etc. If you want to try, just click "Settings" and "Edit" buttons on the main interface.